Prudence Bushnell, the U.S. ambassador to Nairobi when al-Qaeda unleashed its devastating bomb attack in August 1998, gives her account of what happened, how it happened, and its impact twenty years later. On August 7, 1998, three years before President George W. Bush declared a War on Terror, the radical Islamist group al-Qaeda bombed the American embassy in Nairobi, Kenya, where Prudence Bushnell was serving as U.S. ambassador. 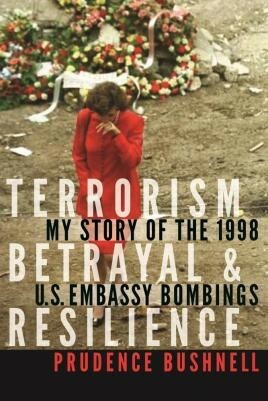 Terrorism, Betrayal, and Resilience is her account of what happened, how it happened, and its impact twenty years later. When the bombs went off in Kenya and neighboring Tanzania that day, Congress was in recess and the White House, along with the entire country, was focused on the Monica Lewinsky scandal. Congress held no hearings about the bombings, the national security community held no after-action reviews, and the mandatory Accountability Review Board focused on narrow security issues. Then on September 11, 2001, al-Qaeda attacked the U.S. homeland and the East Africa bombings became little more than a footnote. Terrorism, Betrayal, and Resilience is Bushnell's account of her quest to understand how these bombings could have happened given the scrutiny bin Laden and his cell in Nairobi had been getting since 1996 from special groups in the National Security Council, the FBI, the CIA, and the NSA. Bushnell tracks national security strategies and assumptions about terrorism and the Muslim world that failed to keep us safe in 1998 and continue unchallenged today. In this hard-hitting, no-holds-barred account she reveals what led to poor decisions in Washington and demonstrates how diplomacy and leadership going forward will be our country's most potent defense.